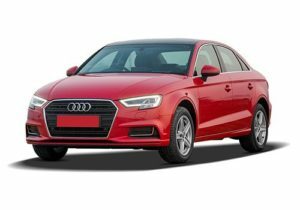 The A3 is certainly a very good looking car, with great proportions, but it doesn’t distinguish itself enough from the rest of the Audi sedan range. The look of an Audi cabin rarely divides opinion, but the A3’s did, and that’s down to its minimalist dashboard. While some found the dash sporty, others found it a touch too plain. The Spartan centre console with its small (albeit beautifully finished) knurled knobs only accentuates the empty expanse on the top of the dash. However, you can opt for a beige-and-black upholstery combo instead, and that should liven things up a great deal. There’s also no questions about quality; it’s excellent through and through. It literally begins at the door with a solid thunk on shut (down to the A3’s use of sound-absorbent steel and not aluminium on its doors). Poke around and you’ll find soft-touch plastics galore and detailing is fantastic too. The turbine-like air con vents, for one, look brilliant and shut with a robust click. Even the reasonably sized glove box comes with felt lining while the storage recesses thoughtfully come with rubberised anti-slip bases. One thing that irked us though, is that the A3’s MMI infotainment screen is not as high-res as BMW’s iDrive unit or, for that matter, even Audi’s more sophisticated systems. Also worth a mention is that petrol A3s can only be had in the second-from-top Premium Plus trim. Interestingly, Audi is offering a sunroof only as a cost option. As for space, anyone familiar with Audi’s larger sedans will immediately find the A3’s cabin a lot more, well, intimate. To be fair, it’s not an issue if you are seated up front, where the electrically adjustable seats are supportive and there is enough head, shoulder and knee room, even for six-footers. You even get a good view out, though irritatingly, the driver’s side door mirror doesn’t have wide enough coverage and often leaves even large vehicles out of sight. Rear seat occupants will have their own issues, which centre on the seeming lack of space. Legroom is decent if the passenger in front cooperates, but the small windows and average width make the rear of the cabin feel no larger than a mid-size sedan. The mediocre headroom further restricts its utility to taller passengers. The bigger issue at the back is not the space but the seat design itself, which hurts comfort the most. It’s just too upright for long journeys and the hard cushioning doesn’t help. Simply put, this is not the ideal car for a family of full-sized adults. That said, the sizeable 425-litre boot does acquit it on the airport run. Audi is offering two engine options on the A3, the 1.8 TFSI and the 2.0 TDI. Both these units have stood the test of time and are one of the best in the business. The same engines are also powering the new Skoda Octavia. The 1.8 TFSI (now labeled as 40 TFSI) spools up 180 HP of peak power between 5100-6200 RPM and 250 NM of twisting force from as low as 1250 RPM until 5000 RPM. Mated to a 7-speed S-tronic transmission, this petrol version hits a century from 0 km/hr in just 7.3 seconds with a ARAI certified fuel efficiency of 16.60 km/l. We haven’t driven this variant yet but if the Octavia (based on the same platform) is anything to go by (same engine in the same tune), expect it to spool up quite a racket. Out test car for the drive was the diesel powered A3 having the 2.0 TDI motor under its hood. This engine has proved its mettle in quite a few cars over and over again. It’s no secret that Audi is more keen to sell the diesel variant and that is precisely where the consumer preferences lie. Badged as 35 TDI on the rear, this 4-cylinder oil burner produces 143 HP between 3500-4000 RPM and 320 NM torque between 1750-3000 RPM. Coupled with a 6-speed S-tronic gearbox, this engine belts the A3 from 0 to 100 km/hr in just 8.6 seconds with an impressive fuel efficiency of 20.38 km/l as per ARAI. The A3 is based on the Volkswagen Group’s lightweight MQB architecture (only other current car in India on the same platform is the Skoda Octavia) and reduction of weight has been a key focus while developing this platform. The A3 uses aluminium bits in the front suspension and even the hood is made of aluminium amongst other things. All these small bits lead to a drastic reduction in weight and the A3 35 TDI weighs just 1315 kgs (unladen). With a better power to weight ratio to brag, the A3 2.0 TDI is quick and feels up to the task at all times. Power is channeled through the front wheels and the 2.0-litre engine feels responsive throughout the rev band. Once the VGT spools up to full song around 1750 RPM, the engine has more than enough grunt for all that is required with a strong mid-range and a reasonably good low-end enabling it to master both the city and highway. The 6-speed S-tronic dual clutch gearbox has three modes, the regular drive mode (D), sports mode (S) and the manual mode (M) through the tiptronic function. The ‘D’ mode is suited for a comfort oriented driving style. The A3 hits the rev limiter at around 4250 RPM in each gear and the upshifts are smooth and non jerky. In order to declutter the dashboard and the central console, Audi had reduced the number of buttons. So now there is no button to get into ‘S’ or Sports mode. All you have to do is flick back the gear stick and the gearbox slots into ‘S’ mode. The car now hits the rev limiter at nearly 4500 RPM and feels even more sure footed. In the manual mode, each gear hits the rev limiter at just under 5000 RPM and progress is quick. The A3 35 TDI has a top speed of 224 km/hr. It reaches 180 km/hr in a flash after which progress is slow to the 200 km/hr mark. The dual clutch S-tronic gearbox is smooth and works the cogs into place with super precision with barely any lag between shifts. Audi has used high quality sound deadening material between the cabin and engine bay and that has a major role to play in the NVH levels. The cabin is insulated from most of the outside sounds and even the engine is not audible at idle. It’s only at high revs when the engine sound makes its way inside the cabin, that too devoid of any diesel clatter. Though we were unable to gauge the real world mileage of the A3 on the drive, we reckon that the 35 TDI should return around 13-14 km/l in the routine Indian driving cycle. Dynamically, the A3 has always been sorted and the 2017 model is no exception. The steering is direct, there is loads of grip and the A3 always feels predictable. Although there is some body roll as you push the car in corners it stays composed and never feels unnerving. The ride quality of this Audi impresses even more. Riding on fairly high profile tyres, it’s suspension ably deals with rough roads, and the whole car remains well planted – something not all similarly priced sedans can claim. All A3 Saloons get stability control as standard, as well as front, side and curtain airbags, a driver’s knee ’bag, and a pop-up bonnet that helps to minimise injuries to pedestrians. However, it’s a bit frustrating that Audi’s Pre-Sense system, which includes autonomous emergency city braking to automatically activate the brakes if it detects an impending collision, is an optional extra. Other optional kit includes rear side airbags and lane-keeping assist, which warns you if you start to wander from your lane. The A3 hatchback received a maximum five-star crash rating from Euro NCAP in 2012, with a particularly strong score for adult crash protection. Euro NCAP says it is satisfied that the A3 Saloon would offer a similar level of protection. An alarm, deadlocks (which prevent a door from being opened, even if the window is smashed) and an engine immobiliser are fitted as standard, and the A3 Saloon received the maximum five stars from security experts Thatcham for resistance to being stolen. It also scored four out of five for guarding against being broken into. If you’re looking for a compact luxury car, you’ll be hard-pressed to find a better value than the 2017 Audi A3. It offers powerful engines, sport-tuned handling, a comfortable ride, and impressive interior tech. However, if you regularly need to haul back-seat passengers or cargo, you may want to think twice. You’ll get more room for friends, family, and all your stuff in the slightly larger Audi A4. The Volkswagen GTI has generous passenger and cargo space too.